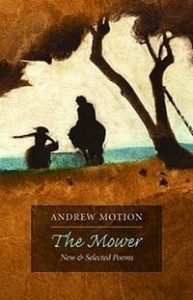 The Mower introduces the poetry of British poet laureate Andrew Motion to American readers for the first time. This selection, chosen by Andrew Motion himself, is an outstanding representation of the poet’s varied body of work elegies, sonnets, poems of social and political observation, and unsentimental poems about childhood, post-war England, and natural life composed over the course of three decades. A significant and consistent feature of Motion’s work, throughout his shifts in style and changes in imaginative topogÂ­raphies, is his signature clarity of observation, his unÂ­willingness to sacrifice intelligibility or embrace opacity. Instead, Motion employs the full power of the English language to do his bidding, and, in love with words as he is, the words cooperate, communicate transforming the intangible, the abstract into intelligible images, associations, and ultimately, knowledge. In his role as poet laureate for the past ten years, Motion has worked to make poetry more widely available to the general public free of charge (through his online archiving of poets reading their work at The Poetry Archive).